A Call To Action From State Senator Chris Larson. 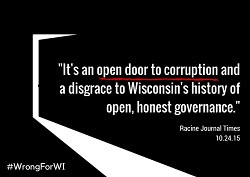 Action Alert: Help Save Clean Government in Wisconsin! 3.) Share this message with friends and family and on social media to help spread the word about these dangerous bills. Check my Facebook page to share graphics and the petition.